Last night we got a big accomplishment done. It's been a long time coming but it finally came; we painted our new sewing room! We invited Bethany over to help us since she loves painting and we got it cranked out. Now it looks so warm and inviting and I think it coordinates nicely with our chocolate brown and pink colors. Here is a time lapse video we made of part of the painting job. Enjoy! It was great having Bethany help us out! This morning we got out to here early and started on the new section of floor. It is starting to look so nice! I think tonight we will finish it off - YEAH!!!! 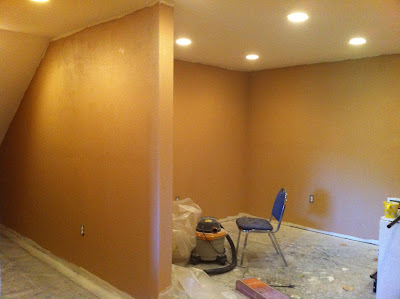 How do you like the wall color? Hey its looking very well Girls nice job. I love painting too. Its nice to see a finished project coming together.